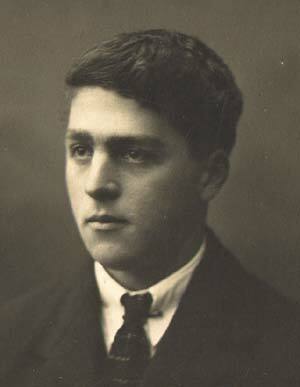 John Leith, the second son son of John and Jane Leith, was born on 6th November 1896 on the family farm of Courtieston, Leslie. 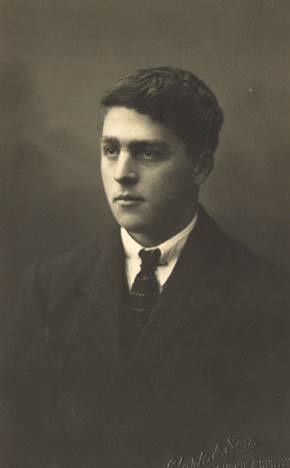 John Leith, Snr died at Courtieston aged only 43 in 1904. 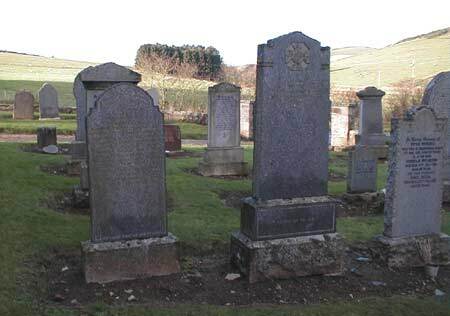 Shortly after, his widow and her five sons moved to the farm of Piperwell at Duncanston, Kennethmont. 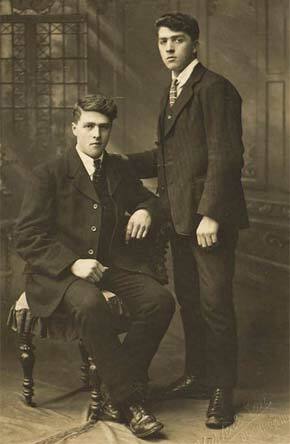 It was from Piperwell that John and his younger brother James left to go on active service. James served in the Machine Gun Corps and was also killed in action. 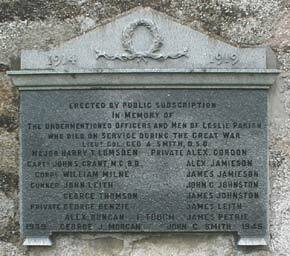 This accounts for the brothers being commemorated by name on both the Leslie and Kennethmont War Memorials. 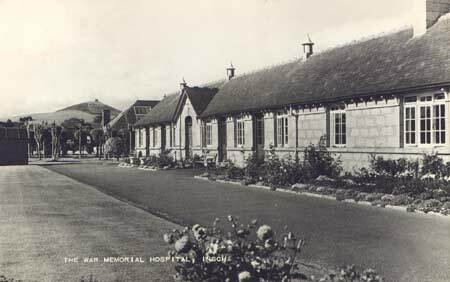 John was working as a farm servant at Tillyangus, Clatt when he enlisted at Aberdeen and was assigned to the Royal Field Artillery, 107th Brigade. It is not known if he enlisted after May 1916 when universal conscription come into effect with a Military Service Act applying to all men regardless of marital status between 18 and 41 years. Working on a farm may have been classed as a ' reserved occupation ' prior to this date. It is known he was not in France or Flanders prior to 1916. The Brigade was the basic tactical unit of the field artillery of the British Army in the Great War of 1914-1918. It was composed of a Brigade Headquarters and a number of batteries of guns or howitzers. 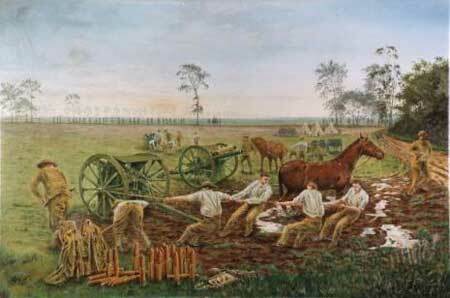 At full establishment, a Brigade of 18-lbr field guns consisted of 795 men, of whom 23 were officers. For a 4.5-inch Howitzer Brigade, this was 755 and 22. Usually lettered A, B and C each battery numbered 198 heads at full establishment manning six 18 Pdr Field Guns. The battery was commanded by a Major or Captain, with a Captain as Second-in-Command, and 3 Lieutenants or Second-Lieutenants in charge of 2-gun sections. Battery establishment also included a Battery Sergeant-Major , a Battery Quartermaster Sergeant , a Farrier-Sergeant, 4 Shoeing Smiths (of which 1 would be a Corporal), 2 Saddlers, 2 Wheelers, 2 Trumpeters, 7 Sergeants, 7 Corporals, 11 Bombardiers, 75 Gunners, 70 Drivers and 10 Gunners acting as Batmen. It is known that John was a member of "B" Battery, 107th Brigade in the 24th Division. Prior to his death it is likely the battery were in positions in the Zillebeke area in preparation for the start of the artillery bombarment on the German lines two miles away prior to The Flanders Offensive or Battles of Third Ypres. This offensive opened on 7th June 1915 and culminated in the Battle of Passchendaele in November of that year. Gunners setting up a 18lb field gun in preparation for the opening bombardment of 3rd Ypres. There were no actions taking place on the day on John's death but it is quite likely he was injured by German shell fire directed on his battery's position and evacuated to the Advanced Dressing Station located at a farm, known by the British soldiers as Transport Farm, near Zillebeke Lake. The ADS buried in the cemetery which was established there in 1915. Transport Farm Cemetery is also known as Railway Dugouts Burial Ground owing to dugouts in the adjoining railway line embankment being used to house an ADS which also buried its dead there. 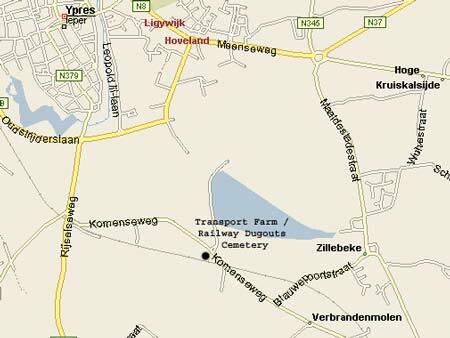 Location of Transport Farm / Railway Dugouts ADS near Zillebeke. At the outbreak of war, field gun batteries of the Regular Army had 6 guns, and those of the Territorial Force 4 guns. The standard weapons, which did not alter during the war, were the 18-lbr field gun, and the 4.5-inch howitzer. Battalion Transport consisted of 13 riding , and 43 draught and pack horses. The provided the power for drawing the six ammunition carts, two water carts, three General Service Wagons (for tools and machine guns), and the MO's Maltese Cart. The Signallers had 9 bicycles. (Note: the Divisional Train also provided four more two-horsed GS Wagons for each Battalion. Not all ranks carried a rifle. Only 5 men in Brigade HQ, 36 in each Battery, and all the Gunners and Drivers in the BAC were thus equipped. Bayonets were not issued. All NCOs and men wore a bandolier. Other Brigade equipment, over and above that carried by the man, included 126 shovels, 18 spades, 72 pickaxes, 27 felling axes, 72 billhooks, 54 hand saws, 46 reaping hooks and a crowbar. There was also a plethora of minor stores and spares. The Brigade also carried a certain amount of ammunition, although this was backed up by the echelons of Transport at Divisional and Lines of Communication levels. Ammunition stock (rounds per gun) 18-lbr 4.5-inch How. Especially as the war progressed, it became rare for a Brigade to be at full establishment with regard to men. Equipment was lost and damaged, and not always replaced quickly or fully. Field guns and howitzers were sometimes lost or abandoned to the enemy, if his infantry penetrated the infantry positions. The guns would almost always be destroyed first, by removing sights or exploding a charge in the barrel or breech. Each Brigade had a detachment at its Base Depot, which did not take the field when the Battalion was on active service. 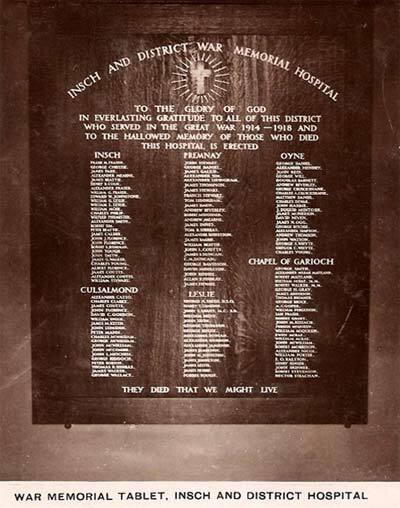 The Base Detachment consisted - in theory - of a subaltern, 2 Sergeants, 5 Drivers and 41 Gunners to form a first reinforcement (to make good Brigade casualties or other losses); 4 Storemen, and a Sergeant-Clerk (who was on the headcount of the Records Section of the Adjutant-General's Office). 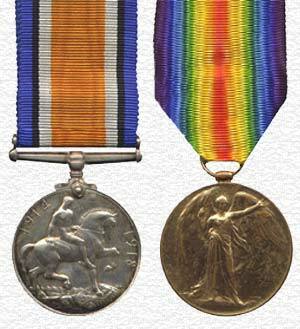 John Leith was awarded these medals for serving his King and Country in The Great War. 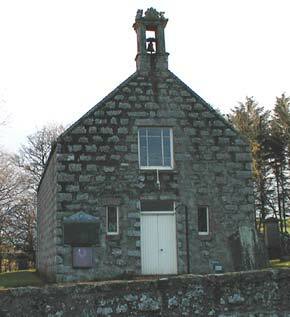 which was built as a memorial to the Fallen of neighbouring parishes including Leslie. 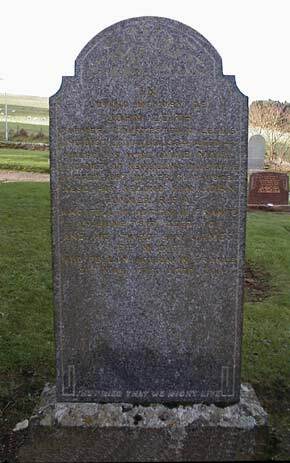 of his nephew Robert Leith, Inverurie.